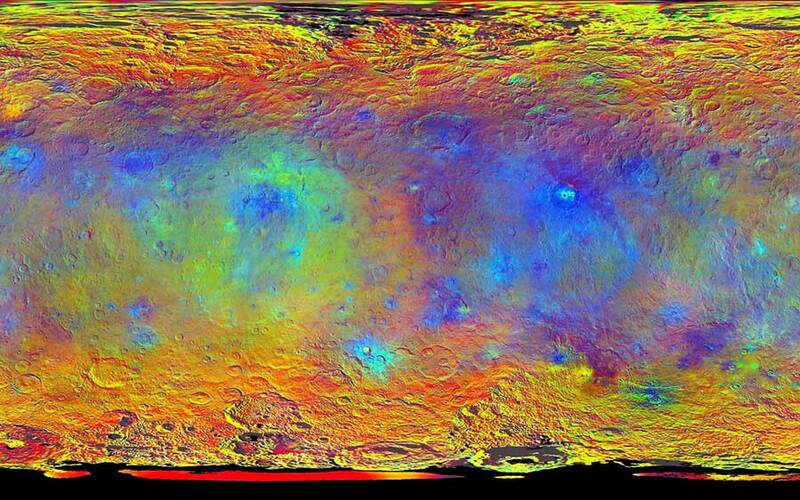 After months analyzing high resolution images of the topography of the surface of the asteroid Ceres, NASA scientists are closer to unveil its nature. The images were sent from the Dawn spacecraft, which has been orbiting the cratered minor planet at an altitude of 915 miles. At first, NASA believed that the spots reflected on the images of the surface of an object on the asteroid were ice formations, given that scientists belief that Ceres has a subsurface ocean that is being exposed by asteroid impacts. Nevertheless, this hypothesis was trashed and scientists are going in a different way. “We believe this is a huge salt deposit […] We know it’s not ice and we’re pretty sure it’s salt, but we don’t know exactly what salt at the present time.” Dawn’s principal investigator Chris Russell told a crowd of scientists Monday at the European Planetary Science Congress in Nantes, France. Russell explained that salt may come from the interior, although they can’t explain it yet, but they discarded the possibility of it coming from other asteroids. Another fact that NASA provided is that the salt is completely dry. The spots are found in Occator – a 56-mile-wide crater on the highland area of Ceres – but they can also be found on other lower areas. Another interesting area that scientists are studying, according to Russell, is a tall mountain that also presents the salt spots. He also pointed out that the unnamed mountain may have a twin, although the Dawn spacecraft haven’t had a good look at it yet. They still don’t have an explanation of how the mountain was formed, but an hypothesis could be that of tectonic forces similar to Earth, but with differences on gravity. Russell concluded with the remaining possibility of finding liquid water on Ceres, needing more research with different equipment. For the moments, the Dawn spacecraft will continue providing images helping researchers analyzing more data to keep taking a deep look on the planet’s mysteries. “Ceres continues to amaze, yet puzzle us, as we examine our multitude of images, spectra and now energetic particle bursts,” said Chris Russell on his talk.